Every year at the beginning of February, Americans look to a special groundhog known as Punxsutawney Phil to see if they’re going to have an early spring. A festival is held on February 2, which is known as Groundhog Day in the United States. On that day Phil is taken out of his burrow in Punxsutawney, Pennsylvania, in front of thousands of festival-goers from all over the world to predict the weather for the rest of the winter. According to the legend, if the groundhog (a marmot also known as a woodchuck) emerges from his winter hibernation and sees his shadow, then the United States is in store for another six weeks of winter weather. If Phil doesn’t see his shadow, then the country should expect an early spring. 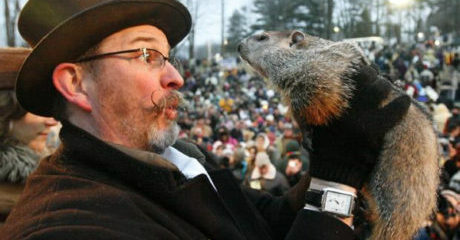 Groundhogs have been predicting the weather from Gobbler’s Knob, near the tiny town of Punxsutawney, since 1887. The event was made even more popular by the 1993 comedy movie Groundhog Day. In the years following the film’s release, crowds as big as 30,000 were on hand in Punxsutawney to watch Phil emerge from his burrow. Government scientists at the National Oceanic and Atmospheric Administration have been tracking actual temperatures in February and March against Phil’s prediction since 1988. The table shows that despite the popularity, the groundhog has had no real predictive skill.